If you are using Excel to chart very large amounts of data, the charts you create can end up being very large, as well. This leads to a problem when printing the chart: Do you print it so it fits on one piece of paper, thereby losing detail, or do you try to maintain the detail and print the chart on multiple pieces of paper? Unfortunately, the answer to what could otherwise be a simple question is complicated by the fact that Excel doesn’t easily allow you to print a single chart across multiple pieces of papers. Instead you are left work around the problem. Fortunately, there are a few things you can do. First of all, you could simply break the data range you are charting into smaller “chunks” of data that would be printed on different charts. Thus, the amount of detail on each chart would depend on the amount of data you are assigning to that chart. For instance, if the data range you want to actually chart is in A1:B2000, you might create 20 charts, with each chart made up of the data from 100 rows. 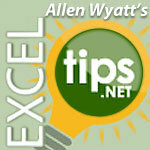 Excel Tips excel charts, excel tips, Microsoft Excel. permalink.